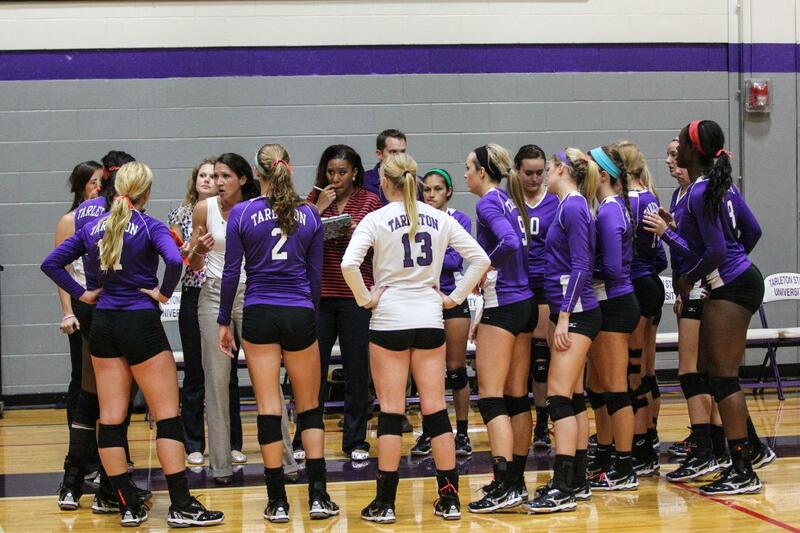 Coach Schindler talking to the TexAnns during a timeout. The Tarleton State University TexAnns are hot off a historical 2014 season with their first Lone Star Conference Tournament win and a run in the NCAA Division II South Central Regional semifinal. Ranked No. 2 in the preseason polls and heading into Mary Schindler’s 11th year as head coach, the TexAnns are excited to get the season rolling. The TexAnns have six returning seniors this year to bring veteran experience to the team, including dominant middle blocker, three-time Lone Star Conference Defensive Player of the Week, and preseason Defensive Player of the Year Kenya Alexander, who led the nation in blocks  with 130 solo blocks and 53 assisted. Also returning for the TexAnns is sophomore outside hitter Hailey Roberts, who in her true freshman year was named Freshman Player of the Year with a recorded 509 kills, first-team all-LSC, and was selected as preseason Offensive Player of the Year. Also in the offseason, the TexAnns hired assistant coach Ashlee Hilbun, a four-year star player from Texas State University, who already has a year of assistant coaching under her belt helping with her team. Schindler said she “plans to go skills specific, and hone in on blocking and focusing on the defensive side of the ball,” when it comes to utilizing Hilbun. To go further, Schindler recognizes this is a brand new team and getting back to the conference championship and the NCAA tournament will not be easy. “We were grateful and fortunate enough to make it to the championship last year and we’re excited, but that was last year” Schindler said. Schindler also reflected on entering her 11th season compared to her first year. The TexAnns have their first Lone Star Conference matchup against the Angelo State University Belles on Sept. 16 in San Angelo, Texas at 7 p.m.